As you’re gearing up for building your outdoor projects this year, take a moment to think about the materials you plan to use. Essentially, you have two choices – a treated lumber (southern yellow pine or hemlock depending on geography), or lumber naturally resistant to rot, decay, and insects (cedar or redwood for example). Expect to pay more for the naturally resistant lumber than the treated material, but know that the treated material will require a bit more work. If the treated material is “wet” when you purchase it, you should allow it to acclimate and dry before you use it. Store and stack it where it won’t get direct sunlight, and sticker it (basically thin strips of wood that elevate each layer of wood). You can try to accelerate this process by storing it in your garage with a fan blowing on it. This process can take up to a few weeks. You’ll also notice the treated material may have (depending on the brand and treating process) and unnatural green hue. You can try to “lighten” this appearance by spraying a bleach solution on the wood, but you’ll extend the drying time by doing this. If you’re making outdoor furniture, I highly recommend you apply a finish on the treated material to create a barrier between it and your skin, and on table tops on which you plan to eat and drink. The treating process is less toxic than it used to be, but I recommend the finish. Note: With cedar, select boards that are darker in color. That part of the wood has more of the naturally resistant components. You can paint or stain your outdoor projects. I like a solid acrylic exterior stain produced by Cabot (PRO.V.T) that’s available at Lowe’s. It’s a sealer and stain all in one. I have several projects in my backyard covered with this stuff and I love it. Two projects have the same color on them, but were built two years apart. I swear, you can’t tell which is the oldest, so the stain obviously takes a long time to fade. That’s saying a lot in the harsh summer sun where I live in Alabama. I also like another Cabot product – Australian Timber Oil. It’s a stain that also has a great UV protective component that will reduce fading, and it doesn’t require an additional top coat. In fact, a spar varnish would blister and flake off the finish if applied. Olympic also makes a nice sealant – Olympic Maximum – that has a 2 year guarantee against graying. I like to use it on anything I don’t put a color. It’s available in a natural tone and looks great on cedar. Make sure you use fasteners rated for exterior use – coated screws, stainless screws, galvanized nails and brads. Treated lumber will need the coated screws for sure. Also, brass fasteners will not rust, but they are much softer than other metals. I also recommend using waterproof glue on projects. A lot of folks argue both for and against it, but I’ve built two of the exact same project (Adirondack chairs), one with glue in assembly, and one without. The one without was quiet rickety after 6 months of exposure. You’ll have quite a bit of expansion and contraction, which will cause the joinery to loosen, so that’s to be expected. Use Titebond II or Titebond III. If your project requires a lot of setup and you need a longer drying time, use the Titebond III. You can also use an exterior polyurethane glue, but be aware that it will expand as it dries. 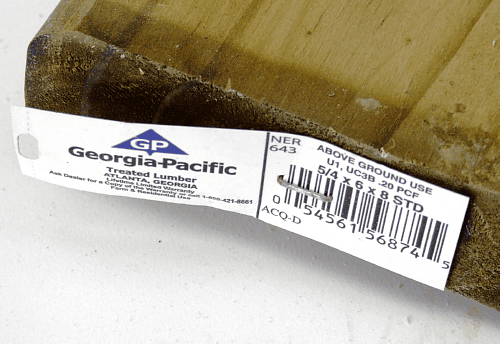 For wood fillers, use exterior grade that will not shrink. Don’t be afraid of using an auto body filler either, which will certainly not shrink. When this product first starts to dry, use an old chisel or putty knife to shave it down level with the surface of the wood – it will be a lot easier to do it then than when it fully dries. As a last little effort to keep my outdoor chairs and tables as protected as possible, I add plastic furniture glides to points on the projects (legs) that will come in contact with the ground, deck, or patio surface. The glides keep the parts from being in direct contact and will help deter the parts from wicking up moisture.